It’s an attractive product idea: easy to use, clean and neat and the results are as good as you’re prepared to make them. With it, you'll be more inclined to do some windows more often. The dirty water tank can be emptied quickly and easily. Kärcher's Window Vac Anniversary Edition is a new, improved version of their WV series, and is claimed to quickly and easily give you sparkling windows and streak-free surfaces. With a 40 per cent longer run time than the WV2, the Anniversary Edition has a very decent 35 minutes' cleaning time. We put it through its paces around the whole house, but in particular inside and outside a glazed extension. We should say that the house in question is by the sea and on a dusty road, so the vac really had its work cut out. Here's how we got on. Which surfaces will the Window Vac be suitable for? 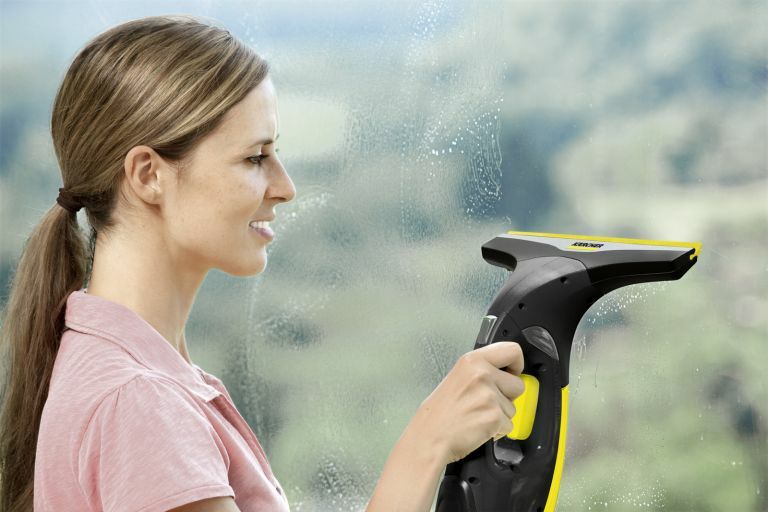 The window vac can be used on all smooth surfaces such as windows, tiles, mirrors, work surfaces or shower screens. Why a Window Vac over conventional window cleaning methods? Kärcher claims that window cleaning is three times faster with the Window Vac than with conventional methods, that drips and streaks have been banished, giving you beautifully clear windows, and that the quick and simple tank emptying means you won't come into contact with dirty water. What's included with the Kärcher Window Vac? Interchangeable suction nozzle, large or small. Glass or window cleaner concentrates. I was surprised to find two units in the box rather than the one I was expecting: the washer and the squeegee/vacuum. This isn’t blindingly obvious from the pictures on the box so I was a bit thrown when I started to scan the instruction leaflet and couldn’t quite make sense of what was what and how they fitted together. As with a lot of international brands, the instructions are illustrations with no immediate text so sometimes it’s hard to work out exactly what they’re trying to get across. This made for a bit of a guessing game to begin with. A second surprise was that I hadn’t realised that I’d have to charge up one of the units before I could start so that set me back three hours until it was ready. Instructions for the enclosed washing liquid say you should add 230ml water to the 20ml of liquid but the washer bottle has no measure on it anywhere that I could see meaning you don’t know what the volume is. I had to measure it separately and pour the water in from a measuring jug. Now I know this, it’s okay, but a measuring jug of some kind would make life easier. Both units were generally easy and very light to hold and to use. I worked with one in each hand and alternated as I went along. Actually, this makes it very efficient; no constant picking up and putting down. I had to adjust how I held the washer unit to prevent some mouldings causing discomfort. The washer unit leaked a bit when I had to use it sideways but I didn’t want to over-tighten it and cause a different problem. I had to keep an eye on this when indoors. One of the best features of this whole concept is ease, speed and efficiency. Very little preparation is needed; it’s like using a cordless vacuum – because it's light and hassle-free, you're tempted to do it more often. The results largely depend on how careful you are. But that’s true of any method, in my experience. There were areas I had to go back and re-do as using any squeegee needs practice to avoid streaks. Streaks started to get more noticeable as the washer unit cloth got dirty from the stuff it lifted off the windows so there’s a need to stop and wash the cloth if your windows are really mucky. That’s also true of any other method. Our windows had a lot of spider droppings and a few birds had flown by. The washer struggled with, this which meant some squeegee streaks. I'd need to put in more prep to get all the stubborn marks off the glass before using the Window Vac. Again, that’s true of any alternative method, too. But, because it’s so easy to use, I’d will be happier to get out and do maybe just few windows at a time more frequently, especially when the spiders and birds have been around. That means the build-up will be far less and the Window Vac would be more effective. More often becomes easier. My guess is that the washer unit bottle holds just enough liquid to do a small bungalow, inside and out. And the dirtier the windows, the more you will need to refill and wash the cloth. The design suits little and often. As a test, I tried using just water and not the cleaning fluid. Not good. So some cleaning liquid is needed. The vacuum squeegee really works: I tried the squeegee without the vacuum to see if it was just a gimmick, and the unit is nowhere near as good without the vacuum because the vacuum takes away water from the surface of the glass and you don’t get a series of drops or a small pool on the window ledge. This is important indoors. What didn't I love? On down strokes, the handles of both units were stopped by window ledges on several windows because the handles are obviously below the wash cloth or the squeegee. This meant having to hold them sideways which caused two problems: first, the washer unit leaked and, second, the squeegee couldn’t finish the down stroke in one go but needed a sideways swipe which sometimes left a horizontal streak. This was especially a problem on full length glass doors/windows. Also, the unit came with just one sachet of cleaner liquid, which was enough to do about a third of my house. Now it’s run out, I’ll need to get some more before I can do the rest. Now, you could choose to clean your windows without bringing another manufactured plastic item into your house which uses yet another battery. It also consumes electricity to charge the batteries. And you’re using some kind of chemical cleaning liquid. However, I'd offset this argument somewhat by saying that the Window Vac uses remarkably little water: I think I could do my whole house using less than a litre of water.